Takes a while to compile that stuff too, and then almost at the end a damn little error like a typo or an xxxxxAO.rsc file missing so after fixing that have to recompile the whole damn thing again. Most of the mod is done and I added the Dormers. The Dormers will fit on about 80 to 90% of the roofs of the 3x4 and 4x4 houses so it is not as bad as I thought it would be but on some roofs although no caps it is not perfect either. On the picture is seen that the dormers not fit on the house with the long roof on one side. If pushed to far in the roof the window will get half covered up and at the edge the dormer is too high so a cap between roof and dormer. All pieces will be free to build and can be deleted just as the ghosted stuff. Some touch ups and testing after my break and the Mod will be ready for release. Probably later today. @embx61 Would you be so kind to release these dormers and verandas also as a standalone mod? Preferably without them raising the ground when placed and with f-variants that do not include the wooden floor. Dormers not have a footprint as they are ghosted and just floating in the air just as the chimney. The mod will be stand alone. It will be an addon for the Village set as they fit only the Village Wooden 3x4 and 4x4 houses. Maybe they fit other houses but this will be more a question of being lucky if they fit other houses. I can make the verandas without the boards and without raising the ground but there are 18 4x1's and 18 3x1's verandas so 36 meshes have to be copied and renamed and have to write the code for them. If I tell the game not to flatten the ground on the ones with the boards the terrain can come through at terrains higher spots. The boards are only 4 high. Many will put a road on those tiles under the roof so the ground will be flattened anyway when they do. There is all ready F key for 6 thatched roof variants, if adding 6 without the boards the players have to click a lot of times the F key to get what they want. F key is a nice feature but an annoyance if overused on 1 object so better to make a set of verandas without the boards. It will delay the release a little bit. I like the bird's nest idea. Something else that we don't have is a dog kennel and a birdhouse. A window flowerbox would also be a good deco piece that could really add a lot of variety to these houses. And lastly some window awnings. Either cloth or shingles/thatch. These are just some ideas for you to consider, either for this set or for future house sets. I know that this would all be a lot of work if you were to do it, so no pressure. I was in the process of copy/paste some meshes for verandas without the floor board part. Then I realized I need 18 Corners to copy paste too. I decided to take another approach which saves poly. I separate the floor board parts from the verandas meshes and players can place them separate. This way I can make the floorboard parts in 3 wood colors on the F key too and need only 1 of each as mesh. A bird nest would hardly be seen because of the low zooming in Banished. It will probably just look like a blob on the ridge board. The other parts are interesting but a lot of work because not all windows are on the same spots side ways in the walls so a lot of awnings/flower boxes are needed to go over every window as where the pivot is set right for one window it will be off for another. A dog kennel is easy but where to put it? On the porch? Better find myself a mesh of a dog too, even when not animated. Can better be even a different deco mod or have to do this in an update some later. This is one of those things like awnings, flower pots, etc. which are easier to do if I do a next housing set and have this idea implemented from the start so windows are all placed at certain pivot points so awnings/flower boxes will always fit. Yes, if you keep your windows in the same position across all your basic house models then it would be much easier to make these sorts of add-ons. I think the awnings might look better on the brick houses rather than the wooden houses. Again, they are all just ideas. Doghouse on porch or veranda would look good. Dog or cat curled up asleep on the porch would also look good. But a doghouse that can be placed anywhere would also be good. Some of those might be useful. So, any news on dormers and verandas add-on?. That "storks nest" idea is so romantic. 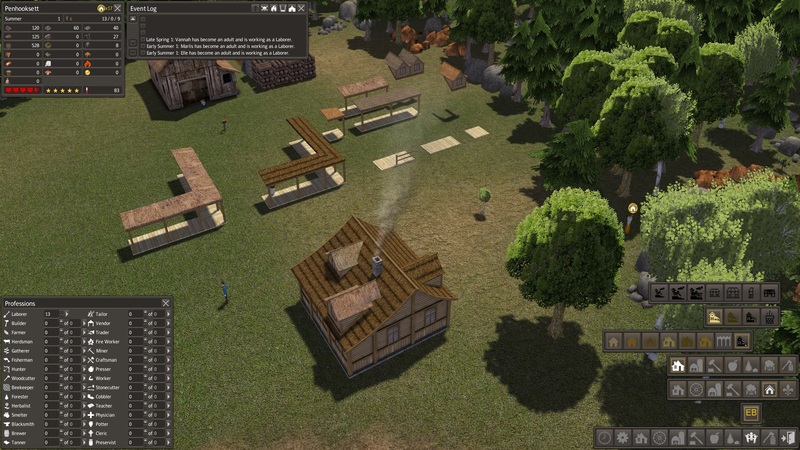 A little bug as told to me by elemental is fixed and uploaded new versions of the Village Production Set and the Village Tannery Stand alone mods. It was a wrong texture assigned to some parts of the build 2 stage. The verandas, dormers mod is almost finished and I expect an upload either later today or tomorrow. Uploaded the Village Houses Addon Set. I also removed the few porches from the 4x4 Village houses set as to not interfere with the Addon Set. So newer version of the 4x4 and EB Village Set are uploaded. I plan in the near future to add some more to the Addon set.